Ahhh, pumpkin season has just arrived. I adore pumpkin. And this friends, is the first pumpkin recipe of the season. 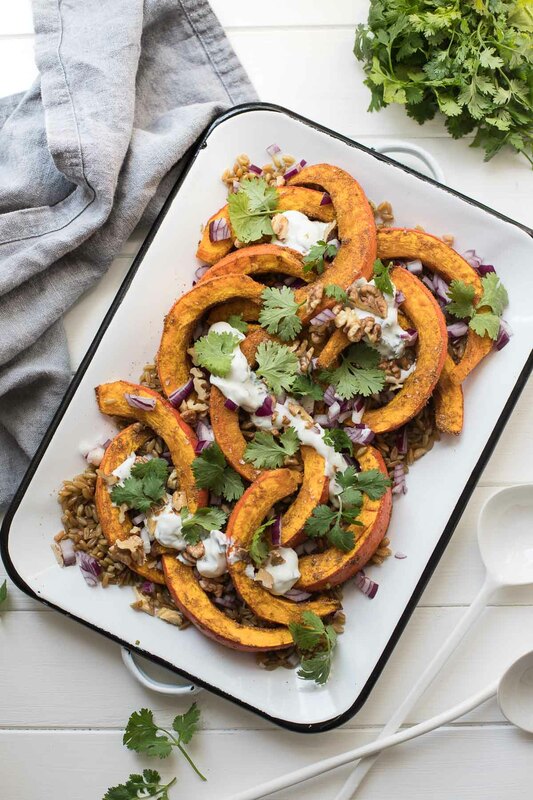 It’s a delicious dish made with spiced roasted Hokkaido pumpkin and Grünkern, roasted walnuts, a little red onion, and a lemony herbed yoghurt dressing. To keep things interesting, the pumpkin is spiced with ground coriander, cumin and cinnamon, then roasted to perfection. I choose Grünkern for this recipe, firstly because I’m such a fan of it, but also because I love it’s nutty, smokey flavor, especially with pumpkin or sweet potatoes. Of course, you could switch out Grünkern for another grain, bulgur is a nice choice, or quinoa, if you are looking for a gluten-free option. I was thinking > Hokkaido pumpkins have arrived > how about roasting one in the oven? > oooh slivers of delicious roasted pumpkin in a salad > these days have been grey, how about a grain salad? 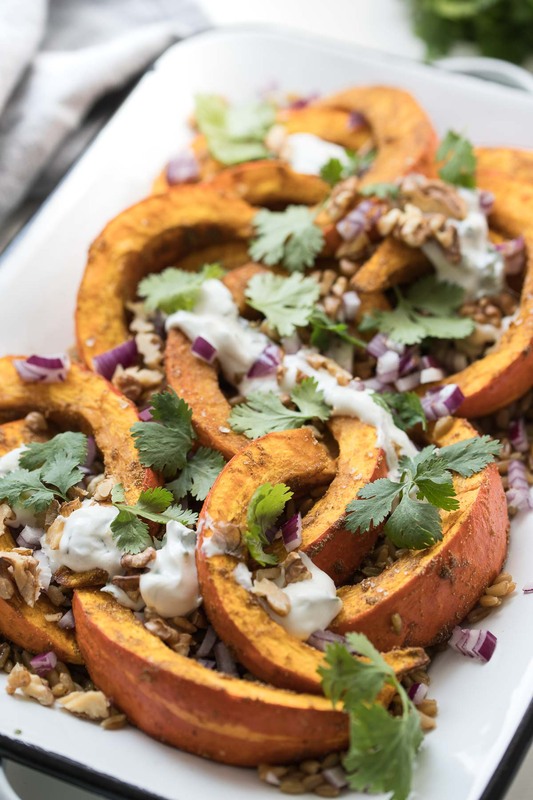 … a fall inspired salad > yes, layers of tasty spiced pumpkin served over one of my favorite grains > Here it is… pumpkin, Grünkern, lemony flavors, herbs, some nutty crunch and a fresh tasting yoghurt dressing > tasty lunch and dinners all around! This roasted Hokkaido pumpkin and Grünkern dish would also make a welcome addition to your holiday table, as a tasty vegetarian side dish. Serve it with turkey (as we do in Canada!) or almost any other meat or poultry dish you can think of. Or keep in on the up-and-up with vegetarians, make a filling meal by tossing the Grünkern with some chickpeas before topping it the pumpkin. So what are you waiting for? I’d say, you should definitely plan a visit to your local market to get all the ingredients for this delicious roasted Hokkaido pumpkin and Grünkern dish. A simple dish that takes full advantage of a fall favorite. Hokkaido Pumpkin. 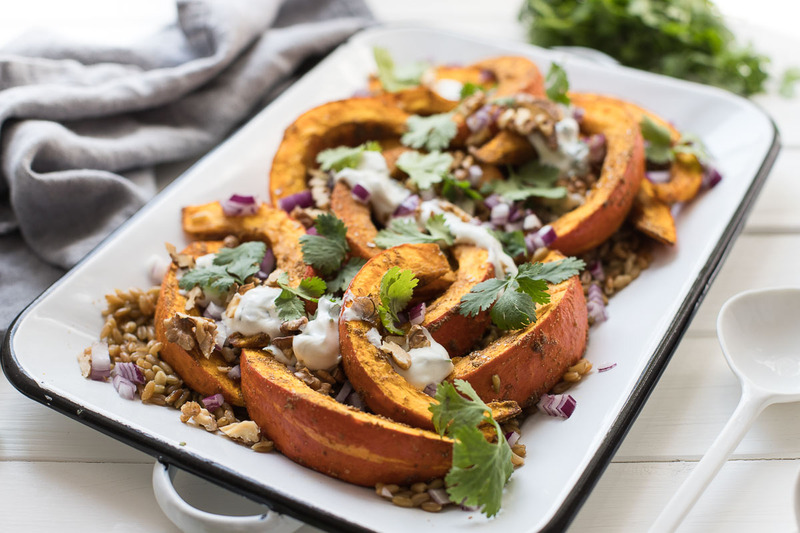 Roasted pumpkin is delicious served over Grünkern, together with walnuts and a lemon and herb yoghurt dressing. Serve as a vegetarian main or side. Preheat oven to 400°F / 200°C and line a tray with parchment paper. Cook the Grünkern according to package instructions; for about 30 minutes. Drain well and transfer to a bowl. Meanwhile, combine 2 tablespoons olive oil and the spices in a small bowl, transfer the pumpkin on to the prepared tray and toss with oil mixture until vegetables are well coated (I use my hands). Spread in a even layer and season with a little salt. Transfer to the oven and roast for 30 minutes, until the pumpkin is tender. Prepare the yoghurt dressing; combine the dressing ingredients in a small bowl, season with salt to taste. Add add the remaining 1,5 tablespoons olive oil and lemon juice to the Grünkern. Stir to combine. Spoon the Grünkern onto a large platter (or serving plates) and top evenly with the roasted pumpkin. Spoon over a little yoghurt dressing and sprinkle with the lemon rind, red onion and roasted walnuts. Garnish with fresh cilantro. Serve remaining yoghurt dressing on the side and enjoy! Feel free to serve with your favorite grain of choice. Bulgur, quinoa or even brown rice work well with this recipe. The skin of the Hokkaido pumpkin can eaten, so no peeling necessary. If you make this roasted Hokkaido pumpkin and Grünkern recipe, I’d love to hear how it turned out for you! Be sure to rate it and leave a comment below to let me know! Especially if you have tips for other readers. Or take a picture and tag me on Instagram @ellerepublic and don’t foget to hashtag #ellerepublic so I don’t miss it!